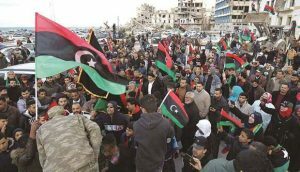 Libyans celebrated the 8th anniversary of the uprising that led to toppling of long serving leader, Muammar Gaddafi in 2011. Eight years ago, Libya experienced social and political unrest which led to the fall of Gaddafi. In Tripoli’s Martyrs’ Square, these events are still etched on the minds of locals. As citizens demanding change, we wanted to take to the streets, chant slogans and raise the flag of independence. But the predators already had other plans”, said Tripoli resident, Ali Mohammed al-Suaihi. Other citizens want the country to move on from the past. “Libya deserves more than what it is currently experiencing. We reach out to our people and urge them to shake hands and reconcile, to forget our hatred and grief and to bury the past”, said another resident, Belkassem Hamed. The North African nation is still recovering from the incident. There are two factions, the Tripoli government backed by the United Nations and the forces of Khalifa Haftar. Elections are expected this year.